The 1999 NFL season was a year of transformation for the Tennessee Titans. First, the name was new, as the club had played the previous two seasons as the Tennessee Oilers after moving from Houston. Second, the team had a permanent home at the new Adelphia Coliseum in Nashville – prior to that, the franchise had played at different venues, including the Liberty Bowl in Memphis, and often before small crowds. During the period of transition, including the final season in Houston, the team had put together three straight 8-8 records. In ’99, Head Coach Jeff Fisher’s team broke out to a 13-3 record, which still wasn’t enough to win the AFC Central (Jacksonville finished at 14-2) but more than enough to grab a Wild Card spot in the playoffs. 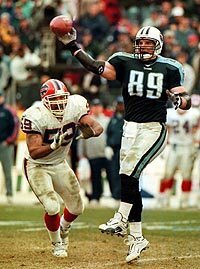 On January 8, 2000 the Titans faced the Buffalo Bills in their first postseason game at their new home. The Bills, coached for the second year by Wade Phillips, were in the playoffs for the tenth time in twelve seasons as they finished second in the AFC East with an 11-5 record. While several of the players who had been key performers during that stretch, such as DE Bruce Smith, WR Andre Reed, and RB Thurman Thomas, were reaching the end of the trail, younger performers like RB Antowain Smith, WR Eric Moulds, LB Sam Cowart, and CB Antoine Winfield made significant contributions. 37-year-old QB Doug Flutie, undersized but popular and typically productive, had held off the challenge of 26-year-old Rob Johnson, but in a controversial move, Coach Phillips chose to bench Flutie in favor of Johnson for the playoff game at Tennessee. With 66,672 fans in attendance at the Adelphia Coliseum, the defenses took control early and the first quarter was scoreless. 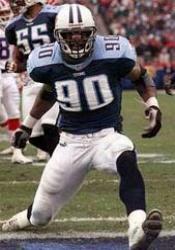 It was a defensive play in the second quarter that put the first points on the board when Tennessee’s star rookie DE Jevon Kearse (pictured below) sacked Johnson in the end zone for a safety. 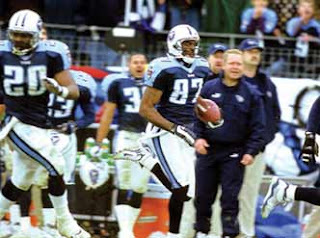 The ensuing free kick was returned 42 yards by WR Derrick Mason to give the Titans excellent field position at the Buffalo 28. They made the most of it as, five plays later, QB Steve McNair ran around end for a one-yard touchdown. With the successful extra point, the home team was ahead by 9-0. After the Bills punted, the Titans again advanced into scoring territory. It looked like they would come up dry when, with time running out in the first half, Al Del Greco missed a 45-yard field goal attempt. However, a holding penalty on the Bills gave Del Greco another shot from five yards closer and this time he was successful. Tennessee went into halftime with a 12-0 lead. The Bills gained just 64 total yards and managed only three first downs in the first half as Johnson had struggled. It quickly became a different story in the second half when, on the opening play from scrimmage of the third quarter, Antowain Smith ran for 44 yards. It set up his four-yard touchdown carry that capped a 62-yard drive and got the Bills back in the game. Later in the third quarter, safety Kurt Schulz deflected a McNair pass that was intercepted by Antoine Winfield. The Bills got another big play when Johnson threw to Eric Moulds, who got ahead of CB Denard Walker down the left sideline, for a 37-yard gain. Kearse was penalized for a roughing the passer penalty to help move the series along and Smith scored another TD, this time from a yard out. The try for a two-point conversion failed but Buffalo was in front by 13-12 with just over eleven minutes remaining in the game. That was it for the offensive output until, with 6:15 remaining, WR Isaac Byrd returned a punt 16 yards to give the Titans possession at the Buffalo 45. Tennessee moved methodically down the field with Eddie George carrying the ball five straight times and Del Greco kicking a 36-yard field goal. The Titans were ahead by 15-13 with 1:48 to go. However, Buffalo got a 33-yard kickoff return from WR Kevin Williams and proceeded to drive 38 yards in six plays. With the clock now down to 16 seconds, Christie was successful on a 41-yard field goal try that put the Bills back on top at 16-15. The Bills kicked off, with Christie booting it short but high to try and hinder a return. The Titans were anticipating a squib kick and had lined up for a desperation return play called Home Run Throwback. RB Lorenzo Neal caught the ball and handed off to TE Frank Wycheck, who then threw a lateral down the 25 yard line to WR Kevin Dyson. The plan was to gain enough yards to get into field goal range, but Dyson made the catch of the low-thrown ball and, led by a convoy of blockers, he proceeded to run 75 yards for a touchdown (pictured at top). It was the first time the Titans had ever run the play and Dyson, who was filling in for the injured Mason, had never practiced it. The Bills furiously argued that the throw from Wycheck (pictured at right) to Dyson was an illegal forward pass, but the play was reviewed by referee Phil Luckett and the call stood – much to the delight of the ecstatic home crowd and the consternation of the shocked Bills players and coaches. Thanks to the touchdown on what came to be referred to as "the Music City Miracle", Tennessee advanced by a final score of 22-16. The Bills led in total yards (219 to 194) although Tennessee had more first downs (16 to 13). Neither team gained much through the air, with Buffalo leading in net passing yards (96 to 55). But the Titans sacked Johnson six times (two by Jevon Kearse) as opposed to Buffalo getting to McNair three times (2.5 by Bruce Smith). The Bills also were penalized ten times, while the home team was flagged twice. Each team turned the ball over on two occasions. Steve McNair completed 13 of 24 passes for just 76 yards with one intercepted, although he ran six times for 19 yards and a TD. Eddie George rushed for 106 yards on 26 carries. Frank Wycheck and TE Jackie Harris each caught four passes, with Wycheck gaining 29 yards to 20 for Harris. For the Bills, Rob Johnson, who had difficulty against the strong Tennessee pass rush but came on in the fourth quarter, was successful on 10 of 22 throws for 131 yards with no touchdowns or interceptions. Antowain Smith paced the ground attack with 79 yards on 14 carries that included two for scores. WR Peerless Price had 5 pass receptions for 62 yards and Eric Moulds also gained 62 yards on his three catches. The Titans went on to win the AFC title and lost a close contest to the St. Louis Rams in the Super Bowl. They went 13-3 again in 2000, although did not advance as far in the postseason. As for the Bills, the loss to Tennessee signaled the beginning of a long playoff drought. They dropped to 8-8 in 2000 and were over .500 just once in the course of the next 13 years (and counting).